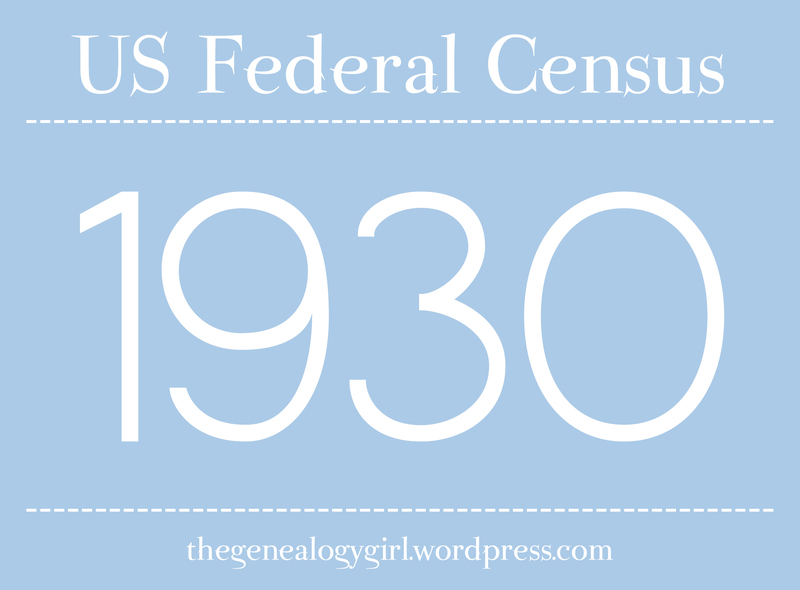 If you missed my post about the 1940 US Federal Census you can read it here. 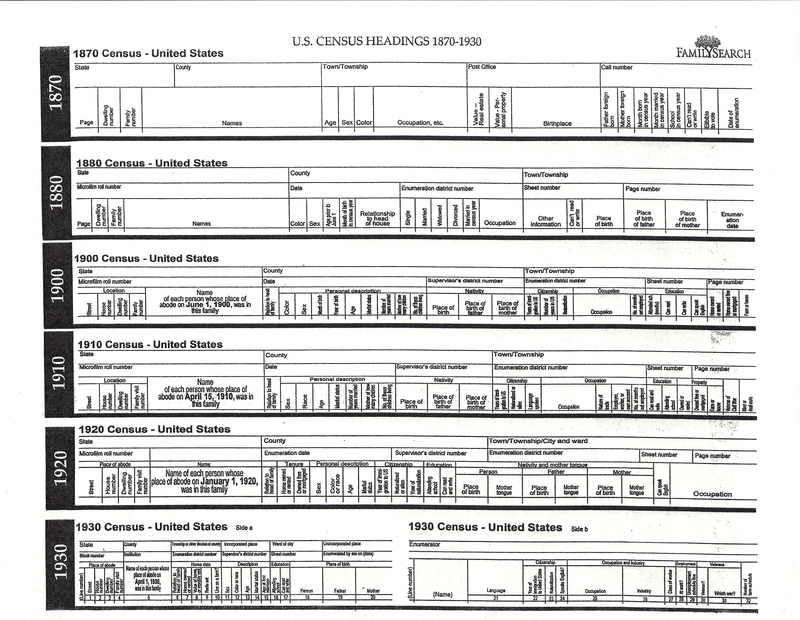 What is the 1930 US Census? It’s an official count of the population of the United States as of 1 April 1930. The census forms also asked demographic questions about individuals. The census date is April 1st. This means that census takers began knocking on doors on or around April 1st and that the questions asked were to be answered based on what was happening on April 1st. Where can I access the 1930 US Census? To access the 1930 Census for free, visit FamilySearch or click this link. What information can I find on the 1930 US Census? I wish I knew who made this chart so that I could give them credit. It is a handout freely available at a FamilySearch Center near me. It has the headings for the 1790-1880 and 1900-1930 census returns. The two censuses that are not represented are 1890 and 1940. You can also get a blank form for the 1930 census here. I used Photoshop magic to put the Maffit family and the easily readable heading together. The far left has a column for street name that I cut off as the street name was not visible in the section for my family. The street name is listed just above their family’s entry and reads 7th Avenue South. Their house number is the first column listed, it reads 1120. This means that the Maffit family address on 1 April 1930 was 1120 7th Avenue South. The heading for their page tells me they live in Great Falls, Cascade, Montana. The next two columns are important to understand. The first is ‘Number of dwelling house in order of visitation’. The second is ‘Number of family in order of visitation’. Why is this important? Well, sometimes different families lived in the same house. If that is the case, the first family listed may have the following numbers for these two columns: 322, 345. The next family would read: 322, 346. The number in the first column, ‘Number of dwelling house’, would not change but the number in the second column, ‘Number of family’, would. You may be thinking that the address column solves this problem and sometimes it does. In rural areas a street and house number wouldn’t be written and these two columns would be your only clues that more than one family was living in the same house. The Maffit family lives in their own home and no other families live with them. Name: Maffit, Seth. Remember the straight line before the other household member’s names indicates they have the same last name as the head of household. Relationship: Head, meaning he is the head of the household. Home owned or rented: R, meaning they rented their home. Value of home, if owned, or monthly rental, if rented: $30. Radio Set: This column was left blank which would indicate to me that they did not own a radio. If they had a radio you would see an ‘R’ in that column. Weird question right? The Department of Commerce says this about that question, “According to the 1930 census, 12 million people had access to radios. A new question, “Does this household have a radio?,” was designed to measure the extent of the nation’s leap into new home-appliance technology. Does this family live on a farm: No. Color or race: W, for white. Age at last birthday: 53. Marital condition: M, for married. Age at first marriage: 24. It is important to note that this question varies on different census returns. 1930 – ‘Age at first marriage’; 1920 – only asks marital status, 1910 – ‘Number of years married’, 1900 – ‘Number of years married’. 1880 and before don’t ask questions regarding marriage date. This question, ‘Age at first marriage’ can give you a tricky answer. If one individual was married twice, the age they should give is from their first marriage. If their spouse was not married previously, using their answers to calculate a marriage year will give you two different years. Both answers are for a first marriage, not necessarily their age when they married each other. Attended school or college anytime since Sept.1,1929: No. Whether able to read and write: Yes. Birthplace of Father: New York. Birthplace of Mother: Canada – Eng, as opposed to being born in Canada and being of French descent which would read Canada – Fr. Language spoken in home before coming to United States: Blank. Year of immigration to the United States: Blank. Whether able to speak English: Yes. Class of worker: W, for wage worker. Whether actually at work: Yes. Line number for unemployed: Blank. Whether a veteran of the U.S. military or naval forces mobilized for any war or expedition: No. What war or expedition: Blank. Number of farm schedule: Blank. What are the best features of the 1930 Census? Street name and house number listed. The home data questions are interesting and helpful. Age at first marriage question can help you calculate an approximate marriage year. Citizenship questions can help you track down immigration/travel and naturalization records. Veteran questions can help you identify family members who served in the military. What tips make using the 1930 Census super great? 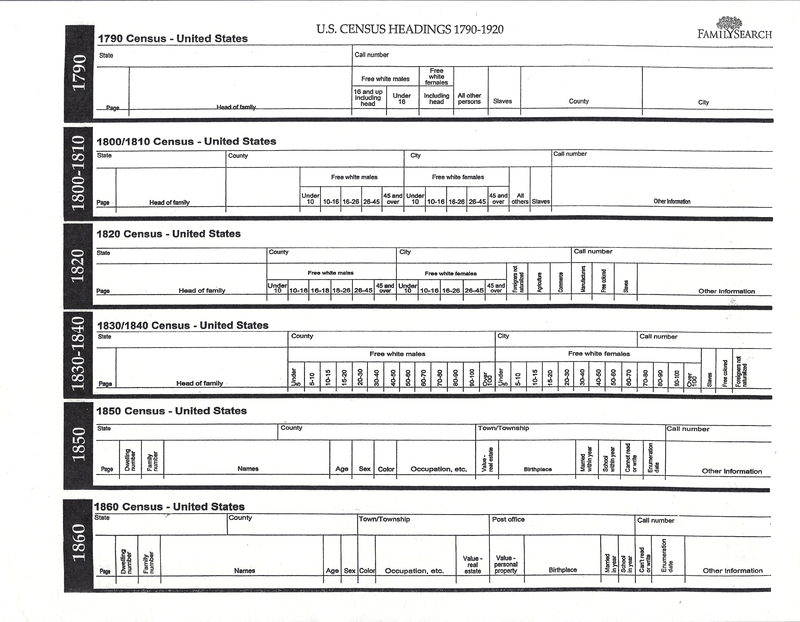 Print a blank census form. Read every single column for each member of the household. Check the whole page for extended family members who may be living nearby. FAQ found at the National Archives has some helpful information. If you can’t find someone, try searching by location instead of by name. And that is the 1930 US Federal Census! Great coverage of the 1930 census. I would add one more thing, however, based on experience with some of my elusive ancestors: Always go forward a page, and back a page from where you find your family member. I’ve located married siblings, parents, in-laws, or children living with a sibling or future mate that I couldn’t find with searches. Did any census taker ever ASK how to spell a family name?! Then if an indexer misreads it, it’s double trouble. I couldn’t agree more. Sometimes when they live in a small town it’s a good idea to look at every page for that town. Those indexing errors can be frustrating and then when the name wasn’t even spelled correctly in the first place it’s even worse! It seems as if in 1930 the population was more fixed and less mobile. The 2010 Census focuses on members of households moving around much more. Thank you. The version of the 2010 census that my family was given asked pretty much nothing. I was so disappointed! I’m glad I wasn’t the only one to think this way. I couldn’t get over the numerous questions about how many people are living at a place and if they are there all the time. There is nothing important about whether the family has a computer–which not everyone does even in 2014. I think a good way to provide a slice-of-life profile for the current time is to interview the older and current generations in a family about different aspects of their lives like socializing in person or online, job search challenges, renting vs. buying a dwelling, and all that. The interviews can be attached to the family tree and passed down as part of the narrative of the family history. I completely agree. I think interviews are invaluable to understanding your family.